French President Emmanuel Macron addressed on March 4 to the Europeans with an open and very emotional letter, published on a wide scale in the media of all 28 EU countries at once. It set forth an ambitious Paris vision of the cardinal reforms of the EU in the areas of foreign, economic and social policy that were proposed to be shared. Six days later, Berlin spoke on the same subject. The program article in the newspaper Welt am Sonntag was answered to the French president by the chairman of the ruling Christian Democratic Union (CDU), Annegret Krump-Karrenbauer, which the German Chancellor Angela Merkel made her official successor. Since the surname of this figure is even difficult for the German to pronounce and write, she is better known in Germany by the acronym AKK. But jokes aside. Germany and France are two pillars and a “motor” of a united Europe, that is, the countries that primarily decide its fate in the past decades, determine the course and pace of European integration. Therefore, it is worth taking a close look at Macron’s dialogue with AKK. The level and form in which Berlin responded to Paris caused confusion in the French ruling circles, which the Germans immediately lowered to the sinful land. As explanations, they presented three points. First, Merkel agrees with the content of the article. Secondly, AKK is her successor. Thirdly, Macron’s open letter was in fact his program in the upcoming European Parliament elections in May, while in Germany, the campaign was conducted not by members of the government, but by the parties and their leaders, therefore the response to Paris was given by AKK, the leader of the CDU, and therefore it is quite official. What unites Berlin and Paris? If we compare the open letter of Macron and the article AKK, then it becomes obvious that there are both coincidences and differences in the views of Paris and Berlin on how to reform the EU. Let's start with the first. AKK supported the proposals of the French President aimed at improving the foreign policy effectiveness of the community, its influence in the international arena, strengthening the external borders of the EU. According to Annegret Kramp-Karrenbauer, “it is necessary to check already at the external borders of the Schengen zone whether the migrant has a reason to seek asylum, whether he has refugee status or another reason for entry”. From the answer to Macron, it is clear that in Berlin they realized that it was impossible to force some European countries to accept illegal migrants, especially from Muslim countries, with the help of threats and dictates. Therefore, AKK proposed another way to demonstrate “solidarity”: - make a feasible contribution to solving this problem in other ways, for example, by allocating border guards to guard the external borders of the EU or by allocating money to keep potential migrants back home. This, in fact, is what Hungary, Poland, the Czech Republic and Slovakia are already doing. It was for such a policy that they were recently criticized; some other EU countries, primarily Germany and France, threatened to punish them with sanctions. So we can say that the Visegrad Group won. What separates Paris and Berlin? At the same time, AKK called the erroneous way "European centralism, European statism, the socialization of debts, the Europeanization of social systems and the minimum wage," which Macron advocates, demagogically agitating for the "European reboot." To do this, they say, they need “a pan-European system of basic social security, equal pay to Europeans for equal work”, as well as a minimum wage adjusted to the conditions of individual countries. AKK is convinced that each EU member state should address these issues on its own, based on its own capabilities and resources. She also spoke out against Macron’s proposal to introduce the EU budget and create the post of euro zone finance minister, because the French president is actually proposing to the Germans to become a “donor” of the EU. AKK proposed “independent responsibility” of national states, directly speaking against the emergence of a “European superstate”. This position is caused, of course, not only by German stinginess, but also taking into account the position of other European countries, especially to the east of the borders of Germany, who are afraid of losing their identity and dissolving in the “super state”, finally losing their right to vote. Since the informal leader of the EU is still Germany, and not France, Berlin is simply obliged to take into account other opinions on this matter. All this is far from what Paris wanted, offering the Germans to agree, and then fill the framework of the European superstate with their "meat", share their welfare with everyone else, so that such ambitious and engaged politicians like Macron could manage all this through the heads of the Germans and other Europeans. Thus, it became finally clear that if Berlin is in favor of strengthening European integration, primarily in foreign and defense policy, then Paris places emphasis on the financial and social spheres. And although the FRG and France want to reform the EU, they often see it in a completely different way, just like who will pay for the banquet. France, generous at the expense of others, believes that it will be Germans, Germany - that everyone will pay for himself. Of course, in Paris they were afraid, moreover, they expected exactly such an answer from Berlin. That is why Macron almost betrayed Merkel on the construction of the Nord Stream-2 pipeline, suddenly taking the side of Germany’s critics, and only at the last moment returned to the earlier automatic support course for Berlin. 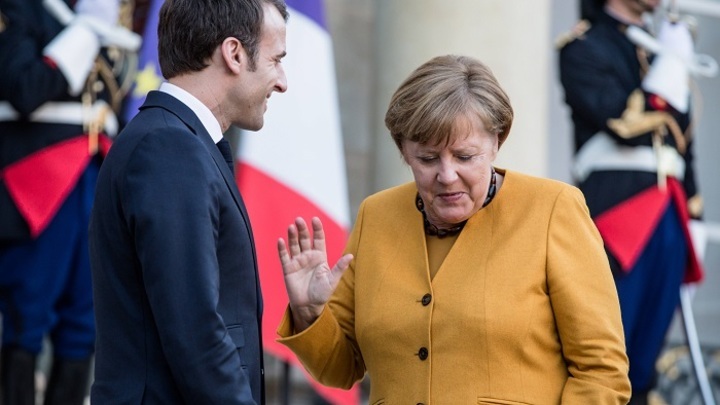 Yes, at the end of January, the leaders of Germany and France signed in Aachen a comprehensive agreement on expanding bilateral cooperation, to speak with one voice and act together in Europe and the world. The reality, however, lies in the fact that the creation by both countries of the new “empire of Charlemagne” is not a very close, and perhaps even unrealizable, perspective, individual tasks within which will be carried out at different speeds and sequences. Since there is no consensus about their priority among the signatories.